There are two main reasons for understanding this simple principle. One is that you are an adult with an adult palate that can and will enjoy so much more complex flavors than just salt and pepper. The other, and most important reason, is that your health could depend on it. A huge percentage of the population deals with high blood pressure, diabetes, renal disease, and other chronic ailments that largely depend on the right healthy diet, especially one that limits sodium intake. 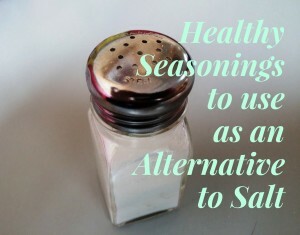 Luckily, you can do without the sodium and get more flavor out of life by skipping the salt and learning what real seasoning is. That adult palate of yours can sense so many different flavors and depth of flavor. This means that you aren’t doing yourself any favors by limiting yourself to salt and pepper. You can enjoy your food so much more by getting creative with flavor. From now on, flavor isn’t limited to sweet or salty, but instead has new adjectives like bright, tangy, zesty, spicy, savory, and mouth-watering. Flavor and seasoning isn’t just about what spices you use to sprinkle on before eating, but also the ingredients in your dish and how it is cooked. For example, the peppery and yet sweet flavor that red and yellow bell peppers can add to a dish. Or the savory flavor that low-sodium broth can add instead of water in some recipes like mashed potatoes, soups, or pasta dishes. The right ingredients make a difference in two parts. First, the use of quality and fresh ingredients will always add a better flavor to your meals than canned or frozen. Second, the flavor of the ingredients themselves and how they will compliment a particular dish is extraordinary. Salt, honestly, cannot truly be called a seasoning. It doesn’t add enough of anything for the palate to pick it up as exciting enough to remark on. Real seasonings have exciting aromas, depth, and so much more to offer. Herbs: Fresh or dried, herbs are versatile and easy to get. In fact, you can even grow them in your own kitchen without much upkeep. This is good because this is one case where fresh is exponentially better than any other option. Add fresh herbs to literally any meal, depending on the flavor you are seeking. Smell the herbs to know what kind of flavor they will add to your meal, and feel free to get creative and experiment. Spices: Spices and spice blends are real seasonings and the options are truly limitless. You can make your own blends with individual spices or you can purchase spice blends in virtually any grocery store. Visit your grocer’s spice aisle for true inspiration or even visit specialty spice shops to see what seasoning was truly meant to be. More: Spicy peppers can pack a punch and lemon juice can brighten up the flavor of almost any recipe. Don’t limit yourself to what you see at the grocery store. Get creative with flavors and really explore all of the mouth-watering flavors that life has to offer. Seasoning is far, far more than just salt and pepper. For foodies everywhere, or for people that just want to enjoy their food more, healthy seasonings like herbs, spices, and more can do wonders for your palate. Not only can you create more delicious meals than ever, but your dishes will be healthier for it. For more ideas on how to make your meals healthier, click here.